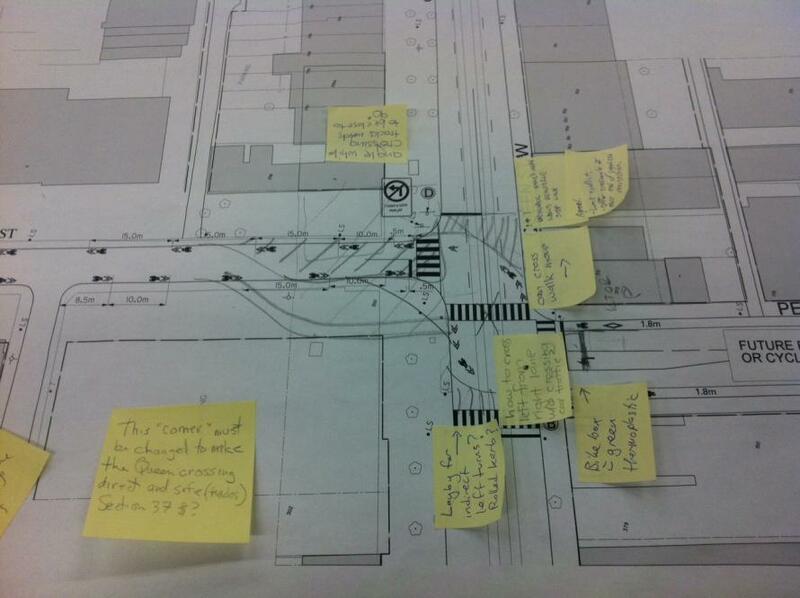 The idea for redesigning the Soho Queen intersection has been floated around for a few years. I've been bringing it up ad nauseum. The City had been largely silent about it, and when staff finally mentioned it presented their own very basic plan as a fait accompli. Turns out that Councillor Vaughan must have been thinking about how the intersection could be remade for some time. All this time we figured that Soho would need to be redirected through the empty lot on the west side of Soho, like in the following photo. But there might be an easier solution. The possible solution came from Councillor Vaughan. Fellow Cycle Toronto volunteer Iain asked Councillor Vaughan last week about this intersection at the public consultation for Soho/Phoebe. The photo at the top is of what Vaughan proposed. The property line for the parking lot on the west side of Soho, which is apparently owned by three "disinterested" dentists in Hong Kong, is quite far back. The street can be moved back quite a bit without affecting the property. This way no negotiations need to take place with any absentee landowners. This would also allow for an larger patio on the east side of Soho, which Vaughan sees as a big plus. But why hadn't Vaughan presented this idea already? Vaughan's been working on the John Street pedestrianization for a few years. Methinks he could have saved himself some trouble if he had presented better ideas for making Soho, Peter and Simcoe better cycling routes. Vaughan may have actually been trying to work out a deal with the landowners, which seems to have gone nowhere due to their lack of interest in developing the lot. From what I understand, making a deal with them hinged on them actually wanting to build something on this lot. But looks like Vaughan didn't want to go that route for whatever reason. I think that most politicians prefer not going "Robert Moses" for cyclists if they can help it. I am a cycling enthusiast, but I am sick of your constant bashing of Adam Vaughan. He is one of the good city councilors [sic]. Just because he doesn't want to put bike lanes on every single street doesn't make him a bad guy. At least he's one of the few councilors [sic] with the guts to stick up against our crack-smokin mayor. I will stop reading your blog if you continue to bash him. Stick to cycling and avoid the politics over [sic] you've lost me as a reader. For his own health I think it best this reader stop reading this blog. I'm not about to give politicians free passes when it comes to making Toronto a good cycling city. I'll give Vaughan a check mark for coming up with an innovative solution for Soho and Queen. But he still gets an X for lack of follow through on his idea. And Vaughan and Transportation Services still get a failing grade on Simcoe, which will still be largely unusable as a bike route even with bike lanes due to the complete lack of a plan for how cyclists will safely cross major streets like Queen and Richmond. It frustrates me to no end that foreigners with zero interest in the positive development of the city can hold up important infrastructure. The politicians should grow some and eminent domain that property to serve the interests of the people who actually live here. I don't think the "foreignness" has anything to do with it. Canadians can be just as much absentee landlords as anyone else and we're just as able at retarding progress based on self-interest. I can understand why the property owners don't want to help unless they're compelled. It's a valuable property. I use my bike TTC to get to work. Bus service is bad in our area so I ride to the subway at Kennedy and then take the subway to Yonge and Queen at St. Mikes. I rode every day I worked during the winter. As soon as I read that someone has decided not to read your blog because of what you wrote, it tells me that this is the blog for me. I hope you continue to pass opinion on anything. As you know, when you ride a bike, you see the city in a whole different way that we learned as children. I'll just pat myself on my back. Thanks Robert. I'm happy to see that there's interest in fixing this intersection for cyclists. I'm always confused about how to proceed since I really want to continue up Soho and then onto Beverley. If the city allegedly owns a chunk of property that is privately used as a parking lot, does the city get a cut of the parking revenue? Can I set up my own parking lot on city property? Is there a requirement to purchase a piece of adjacent property, or do I not even need that? How much time does the city need to not notice for me to continue with no penalty? If I can't and the city finds out, do I have to pay them the ill-gotten revenue? Herb, thank you for posting my previous message defending Adam Vaughan. Like a coward you didn't reply to my message directly. You decided to insult me in a public forum. You're a brave man. I don't know whether you're some tax and spend NDPer or just have a chip on your shoulder. Vaghan is one of the good guys. Hopefully the Liberals can carry this momentum all the way to forming the government. If it were up to you we'd have bike lanes on the 401. Run for office if you don't like Vaghhan. Don't hide behind your computer like a coward. Have a nice day, you jerk! Both a coward and a brave man? How about we split the difference and call me average. I didn't realize bloggers had to run for office if they wrote anything critical about a politician. Actually I figure Vaughan might do a good job in federal politics. I never said I opposed everything he stood for, in fact, he's done a bunch of good things. 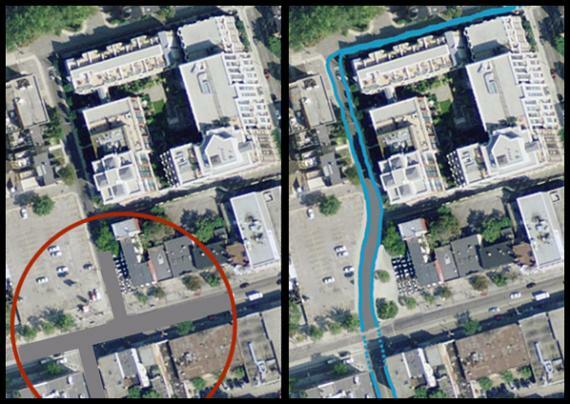 But when it comes to protected bike lanes, Vaughan needed to be persuaded. He came around (mostly) by the end. Hm... bike lanes on the 401? Why didn't I think of that?